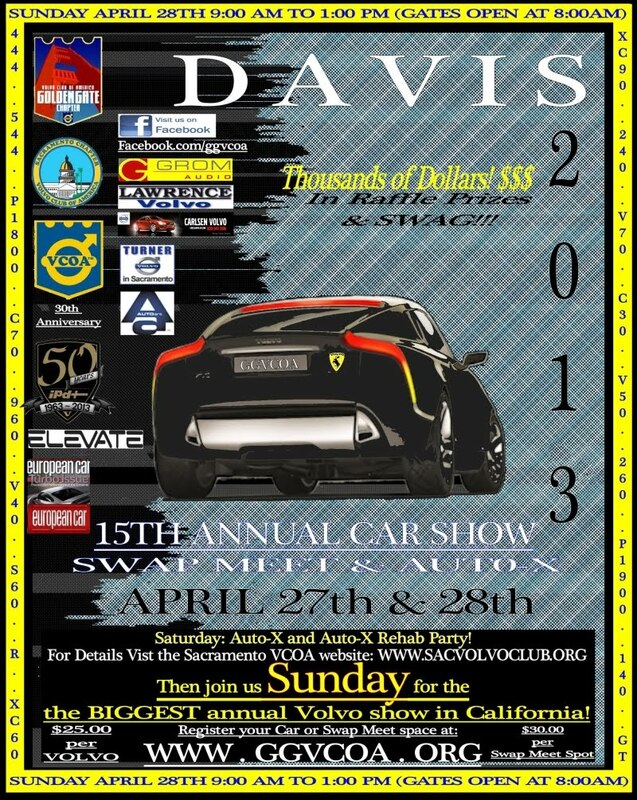 Please join the Golden Gate and Sacramento VCOA Chapters for our 15th Annual Davis Car Show & Swap Meet on April 28th at 9:00am. The annual Davis Car Show & Swap Meet is one of the larger Volvo events on the West Coast, drawing 100+ Volvos and 200+ members from Southern CA all the way up to the state of Washington and across the Sierras to the state of Nevada and regularly sees visitors from Arizona and Texas. This year's car show will be a judged event and have "People's Choice" voting categories! Participation in the judged car show is optional. If you don't wish to be judged, don't worry, you can still have your car on display for everyone else to admire! This year will mark the50th anniversary of IPD and the 30th anniversary of the VCOA and we have big plans to celebrate! --If you need to buy more than one swap meet space, e-mail Justin Lee, GGVCOA President at Justin.lee at ggvcoa dot org directly. Registrations accepted on day of event ($5 in raffle ticket bonus for VCOA members only). National Media Coverage from European Car Magazine and Euro Tuner. -Photographers: Please contact Elizabeth Brown, SacVCOA Webmaster at webmaster at sacvolvoclub dot org if you will be at the Saturday AutoX as there is an opportunity to have your photos published. -Polestar: Donated a Polestar Tune (valued at $1000). Restrictions apply. See below for details. We will be offering 13"x18" hi definition pictures of your car for a small fee and having orders for different show style shirts. Davis Flea Market: Music on the Green will be back at the park again this year. Polestar and GGVCOA are providing a POLESTAR TUNE to a lucky winner at this year’s Davis Volvo Car Show and Swap Meet April 28th!!! Volvo North America is currently making a cool certificate for one lucky winner! Carlson, Lawrence, and Turner Volvo have stepped up and offered to install this for free!!! Details will be posted at the Polestar VIP PASS booth at the Davis Show (By the cool Rebel Blue Polestar C30). This prize is non-transferable (no Resale) and it requires the winner to have access to an eligible car (Listed on the Polestar Website: http://www.polestar.se/en-us-us/performance/show-all/). You do not need to enter your car into the show, but you will need to purchase a Polestar VIP show pass to be eligible ($25). Polestar may need a picture of the winner and may need to contact you to review how well you like the Tune in your Volvo. You may be asked to be featured in our Rolling magazine and possibly in an article in a major car magazine. Odds of winning will be amazing! Odds depend on how many people purchase the VIP pass (example: 1 in 15) This Tune is valued at well over $1000.00! How many chances do you get to win ($1K+) something this cool with amazing odds!? You MUST be present at the time of announcement in order to win. If the selected winner is not present another name will be selected. All details will be available for review during the show prior to winner announcement! GOOD LUCK! If you don't win the Polestar Tune at the show, then you can have this opportunity! We need volunteers for the upcoming Davis car show. See the list below, if you think you can help out, please let us know! We appreciate the help, and it is the volunteers that keep this club moving ahead. If you are interested in volunteering, please e-mail Justin Lee, GGVCOA President at Justin.lee at ggvcoa dot org and let him know the post and shift that you want. However, you will still be able to register at the gate. We accept cash, check and credit card. Second Shift: 8:30 to 10:15 a.m.
Third Shift: 10:15 to 11:45 a.m.
Fourth Shift: 11:45 to 1:30 p.m.